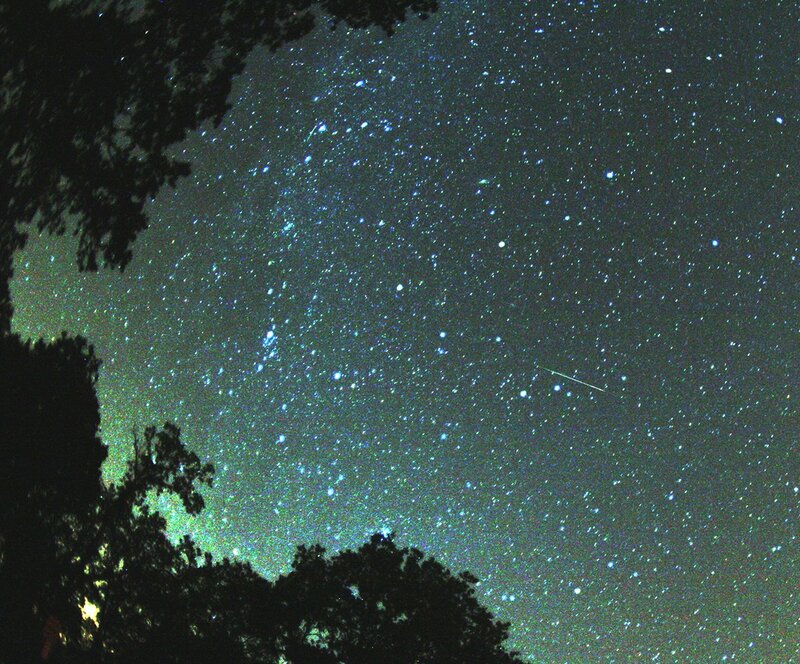 A Perseid in 2007. Tonight, the Perseid meteor shower will be at peak visibility around the globe. The annual event, which takes place every August over the span of several days, is the result of the Earth crossing the path of the large Comet Swift-Tuttle. The resulting comet dust produces meteors when it enters Earth's atmosphere. Unfortunately, light pollution can greatly diminish the visibility of such an event, which is best seen under a dark, open sky, starting about an hour after sunset and continuing on through the pre-dawn hours. Thursday night into Friday morning should also be a good time to view the meteor shower. One spot where visibility won't be an issue is suburban Sugar Grove, which lies about seven miles west of Aurora – roughly 50 miles from the Chicago Tonight studio. On Wednesday, Northern Illinois University and NASA ambassador Joel Knapper will host a viewing party for the shower at the Open Range Southwest Grill at the Bliss Creek Golf Course. The free event is part of NIU's free monthly STEM Café series, which focuses on science, technology, engineering, and math. Food is available for purchase, but you aren't required to eat there. Judy Dymond, NIU Outreach and Engagement Associate, organized this year's viewing party, the fourth such party hosted by the organization. "The meteor shower is quite exciting," Dymond said. "Last year people were screaming out when they saw them." Expect to see about 50 meteors fall each hour. In addition to star gazing, the STEM Café event features three speakers. At 7:45 pm, NASA ambassador Knapper will speak about Pluto, from its discovery in 1930 to new data gathered by New Horizons. Other speakers will discuss the science behind meteor showers (7:30 pm) and the search for life in the solar system (8:20 pm). Guests are welcome to bring telescopes, but NIU will have some on hand. Dymond says that while they can be nice to have, they’re not necessary for viewing the meteor shower, which can be seen with the naked eye. STEM Café held its first rain-or-shine viewing party for the Perseid meteor shower in 2012. Last year, about 175 star gazers attended the party under clear skies. But clouds, and even rain, don’t seem to put a damper on things. For the debut party, it rained. But no matter, said Dymond, "People are going to learn something no matter what happens." Registration is not required to attend tonight’s event, but you can email or call Dymond if you plan to attend. An outdoor area is available for any overflow crowds that may develop. You can also watch the meteor shower live online, via NASA's UStream channel from Wednesday night into the wee hours of Thursday morning. Learn more about upcoming STEM Café events.